It looked like people enjoyed the Super Adventure of Against the Giants. Well, I don't have another "Super Adventure" but I do have a couple of super adventures. 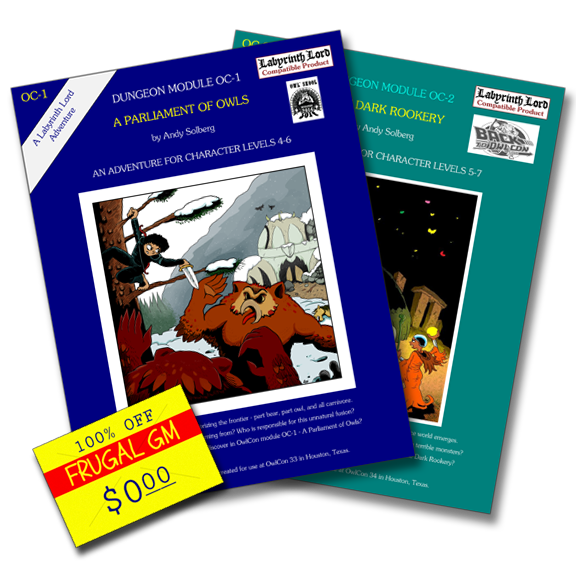 OC-1: A Parliament of Owls and OC-2: The Dark Rookery are Labyrinth Lord adventures written for the 2014 & 2015 Owlcon Convention. Both feature art from James V West and as much as I'd like to go in an do a review, you should just go ahead and download these for yourself.